The premiums from Clientele funeral cover quotes start from as little as R5.33 per day per individual covered in the company's Funeral Dignity Plan. 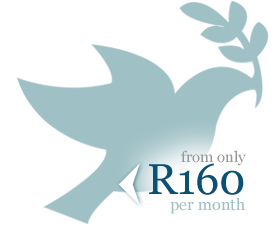 This funeral cover is really one of the best and most comprehensive in South Africa. Under your plan, you can sit comfortably knowing that you and your entire family are covered by one of the country's most trusted names in funeral insurance. An inclusive unveiling, transportation to the burial and grocery benefit. The grocery benefit is paid for the funeral, while the unveiling benefit is paid out within a year after the funeral. Again, what makes Clientele's Ultimate Dignity Plan so sought after is the company's emphasis on family. When you or anyone in your extended family passes away, you may not be adequately prepared for the financial losses that come with preparing and conducting a burial. That's just one part of the entire experience, where in so many cases, the passing of a family member can lead to a loss of income for the family. A funeral policy from Clientele or any other provider of funeral cover can be that cushion you and/or your family will really on in your time of grieving. With funeral cover from Clientele, you can cover your extended family from as little as R120 per month for a youngster under 35 years old, and starting at R215 for R10-000 cover for the older generation of 71 to 80 years old, like parents and grandparents for example. will never sell or rent your details.